Discover the Natural Ways to Overcome Depression! 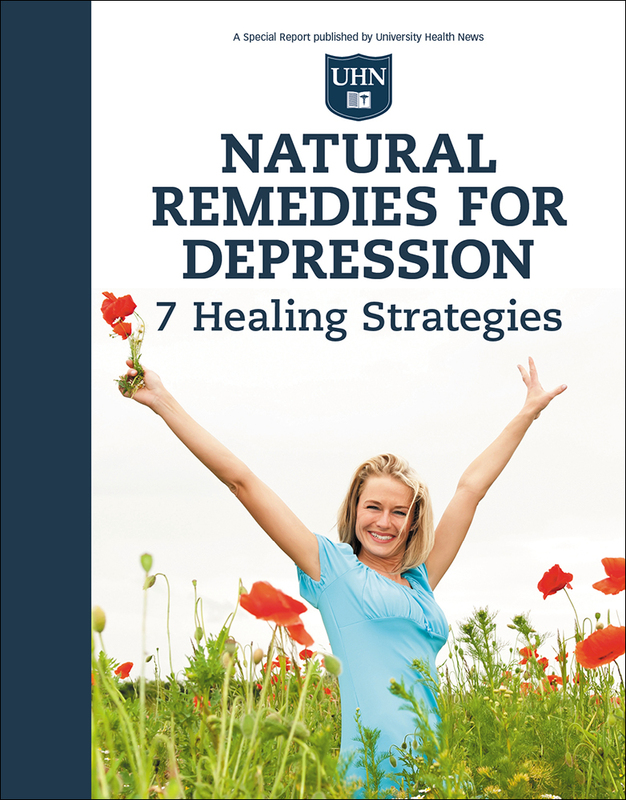 Order your copy of Natural Remedies for Depression and discover the hidden problems that are likely causing your depression and the natural solutions that can help you loosen the grip depression has on your life. Order your copy of Natural Remedies for Depression today. Discover the scientifically studied natural remedies that can help you overcome depression! This just-published report shows you how to correct the problems that are actually causing the depression instead of just masking symptoms! Whether you’re just feeling the first signs of depression or have been fighting it for years, I’ve got good news. First, no matter how isolated depression may be making you feel—you are not alone. Nearly 30 million Americans suffer from depression – and 25% of women are affected. Here’s the really good news: you can overcome the debilitating grasp depression has on you. Not only are there effective medications available – there are natural remedies that actually help heal the cause of the depression instead of just masking symptoms. What’s more, when you follow the natural healing strategies in this report, you get the added bonus of beneficial side effects that may help solve other chronic health conditions. This just-published report from the health experts at University Health News – the renowned repository of cutting-edge health information from some of the nation’s most respected medical schools, hospitals, and health centers—brings you the most effective ways to relieve depression. These treatments are the result of evidence-based research; they are backed by impressive clinical trials and recommended by leading natural and integrative medical doctors. This new report is yours to read with our 30-day Risk-FREE Guarantee! Natural Remedies for Depression is a practical, how-to guide that reveals the signs, symptoms, and root causes of depression, as well as the conventional and natural treatments that can help relieve it. You’ll discover the side effects of antidepressant drugs, what to expect from an integrative treatment program, the foods and supplements that can help restore your mood, and how soon you can expect to start feeling better. We all have off days or tough times that get us down. But depression is different than having the blues, in the same way that a stomach bug is different than a chronic problem like irritable bowel syndrome even though some symptoms may be the same. To free yourself from depression and experience real relief it’s important to understand exactly what it is. It’s not something you can “shake off” like a bad day. Depression is a disease that comes from biological and chemical imbalances in your body. Although it is a complex condition, when you provide your body with the right tools you can prevent and heal the problem. Natural Remedies for Depression will help you uncover the possible causes for your depression and reveal the natural treatments that can help get things back in balance. Most depression is linked to hormonal or chemical imbalances in your body. In fact, depression could be an early warning sign of other problems inside your body. For example, depression is a common by-product of a low-functioning thyroid gland—correcting the thyroid function not only heals the depression, but also improves your metabolism, energy, weight loss efforts and more. That’s why it is so important to get at the root cause of your depression so you can fix the real problem and experience the total healing effect. You’ve probably heard of serotonin and dopamine. These are two neurotransmitters, or brain chemicals, that relay messages between nerve cells throughout your body. Serotonin works to keep your mood happy while dopamine helps you focus. So when there is a deficiency in these neurotransmitters your mood, memory and other brain functions go haywire. Depression is one of the results of a neurotransmitter imbalance. Two reasons brain chemicals can get out of whack. First, mood-regulating neurotransmitters like serotonin and dopamine can become depleted due to prescription drug side effects or from improper functioning of certain systems within your body. Secondly, your body may not be producing enough of these brain chemicals, which is often caused by nutrient deficiencies. Does your energy level drop in the afternoon? Do you crave carbs or salt? Do you suffer from fatigue, insomnia, or weight gain? These are common signs hormonal problems may be triggering your depression. Hormones influence almost every cell and organ in your body and they are closely linked to proper brain function and depression. Research shows that today’s world causes us to experience stress on a chronic basis. We’re overworked. Poorly nourished. And with our always-on devices we get almost no down time to rest and recover. And it isn’t just outward signs of stress like difficult bosses or a houseful of teenagers that cause stress. Everything from pesticides in foods to a diet high in carbohydrates and sugar put undue stress on our body, which wreaks havoc on our hormones and can lead to depression, memory loss, and other problems. Are you filled with worry? Do you obsess over small problems? Feel irritable? Do you crave sugar or caffeine? Feel light headed? Tired? Do you procrastinate? Are you forgetful? Have trouble concentrating? These are signs of imbalances of the brain chemicals serotonin or dopamine in your body. You’re probably wondering how did these chemicals become imbalanced? Natural Remedies for Depression will fill you in. In easy-to-understand language our health experts will explain the 6 most common causes of depression and reveal strategies to relieve each one naturally. You’ll learn why men and women often have different depressive symptoms (men are more likely to lose interest in things, while women tend to experience feelings of sadness and guilt). Did you know omega-3 supplements have been conclusively shown to increase serotonin levels in the brain? What’s more, countries with the highest omega-3 fat consumption have 60 times lower depression rates than those countries with the lowest omega-3 fat intake. The supplement shown in scientific studies to have a beneficial effect on depressive symptoms—possibly even severe depression. No doubt you’ve also heard that exercise is a great way to relieve depression. In fact, the latest information suggests exercise is as effective as anti-depressant drugs or cognitive behavioral therapy. But how can you get motivated to exercise when you’re depressed and don’t feel like doing anything? Natural Remedies for Depression brings you the tips and strategies you need to overcome these feelings. This just-published report from the experts at University Health News brings you natural solutions for overcoming depression. From foods and supplements that can restore hormone and neurotransmitter levels to normal to exercise, light therapy, and making sure you’re getting enough vitamin D you’ll find everything you need to break free from depression naturally!